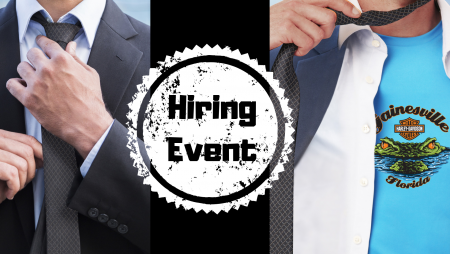 Sales Professional Hiring Event - No Tie Required! Are you an experienced sales professional looking for a new challenge? Ditch the formal attire and join a growing team of dedicated, hard-working owners and staff at Gainesville Harley-Davidson. No experience with the Harley-Davidson brand or vehicle sales? No problem! We’re seeking self-motivated, eager, and exciting individuals to staff several departments including General Merchandise, Parts & Accessories, & Vehicle Sales. If you have a proven track record of successful sales experience with any product or service, we want to meet you. Visit the Gainesville Harley-Davidson dealership on Wednesday Feb. 13th from 9a-5p for a Manager Meet 'N Greet. You can fill out an application at gainesvilleharley.com and bring it with you along with your resume to meet us in person. If this date and time doesn’t work for you, we would still love to hear from you! You can submit your resume online anytime at gainesvilleharley.com. Gainesville Harley-Davidson is family owned and operated for 26 years and we strive to make each and every employee feel like part of the family too! Come experience the thrill of working for one of America’s most iconic brands in an environment that’s fun, supportive and community oriented.